Each one of us has an innate desire to be successful. You only have to look at little kids and notice how fast they develop the desire to WIN and be more successful in anything they try. In fact, one of the biggest challenges as a parent is teaching kids how to deal with „losing“. Why is that? Winning feels GOOOOD! Losing, not so much. Winning means you‘ve been successful in a competition of some sort and, because it gives you a feeling of accomplishment and pleasure, you love it! But as we get older, we might let the noise of day to day life get in the way of our striving for success, our striving to win in the game of life. We forget how good it feels to win, to be successful and we accept, somehow, the notion that something called “Fear Of Success” actually exists. To rekindle that fire and, not only that, but also to show that it’s worth the effort, here are 10 tips that will help you win or succeed more often in the game of life, independently of what succeeding means to you. To be able to achieve ANYTHING, you have to „start something“. It might sound simplistic and very logical, but it‘s unbelievable the amount of people who keep dreaming about a goal but NEVER DO ANYTHING to get themselves closer to making it a reality. Only if you start, you‘ll have a chance at finishing. That first step is the MOST IMPORTANT thing you can do to become successful. I don‘t care how big or small, how easy or difficult your dreams are. If you don‘t start, NOTHING will happen in the REAL WORLD. Expectations are a picture in your head about how something SHOULD be. The problem is, reality might deliver a surprise. If what reality delivers differs from the picture in your head, you might feel completely frustrated and disappointed. So, by leading with expectations, you might be setting yourself up for those negative feelings. Intentions, on the other hand, reveal a DIRECTION you wish to take to achieve something. Since it‘s ‚just‘ a direction, you have always the ability to CORRECT YOUR PATH if you discover, that you‘ve been somehow drifted from the main goal. It might take longer, but you know that if you continue going, you‘ll eventually get to your INTENDED destination. No matter what you want to achieve, you will fail and, likely, more than once. How do you react when this happens? Do you just give up and consider yourself a failure? One little illustration should help you understand the PURPOSE OF FAILURE. Yes, it has a purpose you should never forget. Think of babies and how they learn to walk. How many times do they fail when starting to walk? Do they give up? From this video it should be clear that FAILURE helps us be BETTER AT SUCCEEDING! So, get excited if you fail, for you‘re getting better at understanding success. 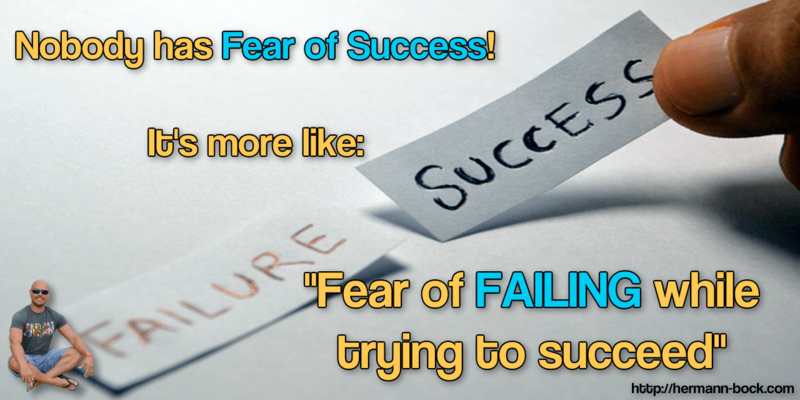 Fear of succeeding, what is that? If you think logically, it makes NO SENSE. Why would anyone be afraid of succeeding, when succeeding feels soooo good? To be honest, it‘s more likely you have FEAR OF FAILING AT TRYING TO SUCCEED, or you‘re afraid of change. How to deal with fear then? Do you get it? Fear is regularly something that happens IN YOUR HEAD caused by movies you play in your mind. These movies might not even be based on reality. Therefore, examine the movies in your head and determine if they‘re in accordance with facts and reality. Basically, be afraid but DO IT anyway! I don‘t know how old are you. But I‘m pretty sure that if you‘ve read to this point, you‘ve witnessed big changes in the world during your lifetime. It might be the demise of the old cell phones in favor of the smartphones or, if we go back in time, you might remember when cell phones didn‘t even exist. Or MP3s, or the Internet. The point is, this world is changing everyday and the speed of change is accelerating.That means that almost anything you learn today has a very short lifespan. It will soon be obsolete and forgotten and new things will come along and replace them. Things we can‘t even imagine today. It‘s therefore imperative that you are willing to CONSTANTLY be in a LEARNING MODE. Embrace new stuff, welcome change, be curious about your sorroundings and what it can teach you. Change is the only constant of the new world. And whatever you learned or are learning in school, is probably obsolete by now. So, make up your mind and be ready to learn for the rest of your life. Remember tip number 1 about starting stuff? It can only be possible if you DECIDE to start. So, actually, before even starting you have to use your power to make decisions. We make lots of decisions everyday, some small, some a bit bigger. However, decisions about achieving our dreams tend to be a bit more, how could I say it, lost in the noise of day to day life. This is actually very sad, because only by having a purpose, which comes from doing something that we really want to do, is that we can be really happy. Which highlights the importance of making decisions about starting or continuing to pursue our dreams. To know more about how to take decisions, take a look at my previous article about this subject. The PAST is gone! And even your memories of it might be distorted. What‘s actually the past good for? To TEACH us lessons that can be used to live a better life IN THE PRESENT. Obviously, you should be VERY PICKY and only choose lessons that are to your advantage in your quest for success. You have the power to decide which lessons you‘ll take from your past. Imagine the future you want and be as clear about it as possible, and then take actions IN THE PRESENT to increase the chances to make that intended future a reality. Every successful person has systems in place that saves them time and effort. Systems allow a person to not waste time. What are systems you ask? Anything that works in an almost automatic way for your benefit. Utilizing HABITS for your advantage could be a way of implementing systems at the personal level. Once you‘ve implemented a habit, you don‘t have to think. And once it happens automatically, it becomes a system! But there are systems at other levels. For instance, if you are a blogger ,having an AUTORESPONDER to collect emails and send automated messages to your list, is a way of having a system. It frees you to do other‚ more important‘ stuff, increasing your chances of success. Take a look around you and try to discover better and more efficient ways of doing stuff. Habits and automation are two good examples of using systems for success. What benefit does it have if when you‘re finally successful you cannot enjoy your success because you‘re ill or have no energy?Becoming a success „normally“ takes time. Becoming a sufferer of what is called a „civilization‘s disease“ takes time as well. So, how to improve your chances of being healthy by the time you achieve your success? By taking care of yourself. That means, exercising, eating healthy and having some kind of regime to keep your inner, spiritual, emotional self healthy too. Gone are the days when success was measured by the size of your waist. Doing stuff to stay healthy is not just a fad that‘s ‚IN‘ now. It should be something you do for the rest of your days. And it has the benefit that it helps you enjoy, not only the destination of success, but the journey as well. It gives you more energy, more zest for doing those things that might mold the future that you intend. You‘ve heard it before: „Rome wasn‘t built in a day“, but I‘m sure everyday a bit was built until it became the magnificent city we all know about. Same thing with you. Your success requires consistency and patience. Consistency to keep at it day after day, when it looks like nothing is being achieved. When it seems that you‘re wasting your time. And patience to be able to wait until that sweet success arrives. Because, when it does, you realize that it was all worth it because it feels GOOOD! So there you go, 10 tips that will greatly improve your chances of success in whatever it is you want to achieve. Do you have other tips that you‘ve applied that have also brought you closer to success? I’d love to know about them in the comments below.